Indication S-Adenosylmethionine (SAMe) is used as a drug in Europe for the treatment of depression, liver disorders, fibromyalgia, and osteoarthritis. It has also been introduced into the United States market as a dietary supplement for the support of bone and joint health, as well as mood and emotional well being. 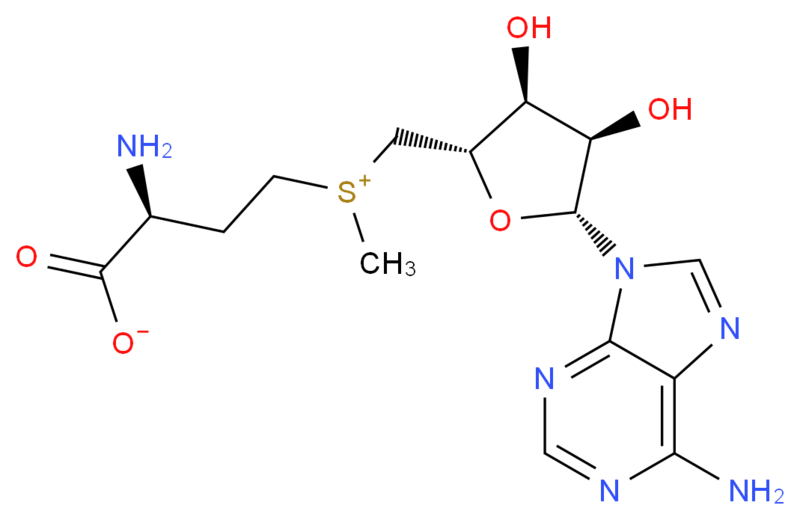 Pharmacology S-adenosylmethionine is an intermediate metabolite of methionine. Its involvement in methylation assists in cellular growth and repair, maintains the phospho-bilipid layer in cell membranes. It also helps in the maintenance of the action of several hormones and neurotransmitters that affect mood. Highest concentration are found in the brain and the liver. Toxicity Irritating to mucus membranes and upper respiratory tract. Can cause CNS depression. Biotransformation Significant first-pass metabolism in the liver. Approximately 50% of S-Adenosylmethionine (SAMe) is metabolized in the liver. SAMe is metabolized to S-adenosylhomocysteine, which is then metabolized to homocysteine. Homocysteine can either be metabolized to cystathionine and then cysteine or to methionine. The cofactor in the metabolism of homocysteine to cysteine is vitamin B6. Cofactors for the metabolism of homocysteine to methionine are folic acid, vitamin B12 and betaine. Absorption S-Adenosylmethionine is absorbed from the small intestine following oral intake. As absorption is affected by food, it is best to take on an empty stomach. Bioavailability is low following oral intake.